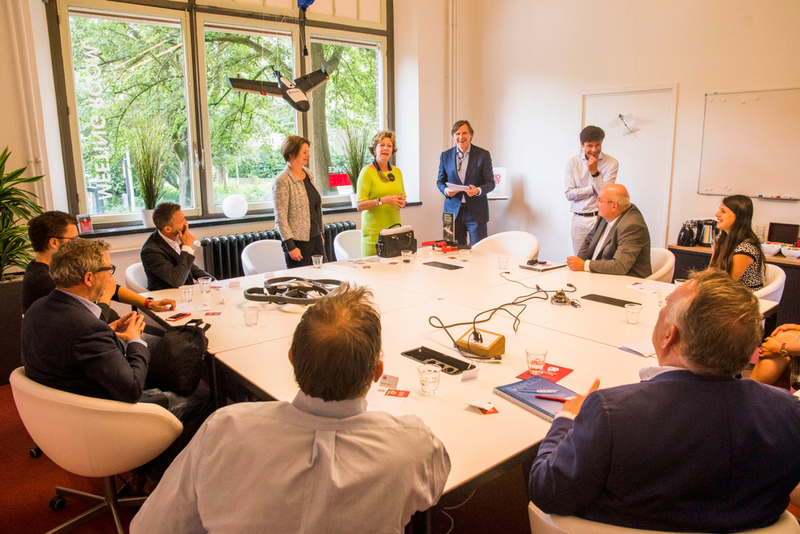 Neelie Kroes, Special Envoy of StartupDelta, visited RoboValley. We organised a round table at our office, where Kroes asked us about our ambitions and gave us her view on the future. The former EU-Commissioner made it clear that we shouldn’t be modest and she showed a particular interest in ‘RoboQuarter’. The meeting was moderated by Programme Manager Arthur de Crook. Further attendants were Sigrid Johanisse, Jeroen van den Hoven, Dap Hartmann, Martijn Wisse, Arie van den Ende, Anne-Lize Hoftijzer, Maja Rudinac, Richard van der Linde and Nils Beers. "The level of your students and the level of your faculties are impressive"
RoboValley is aiming to do that, responded Hoftijzer. The Science Centre already plays a similar role. It is based in a building with start-ups and organises lots of activities for children. The round table concluded with a presentation from Dap Hartmann about turning technology into business and the start-ups Ampelmann and Taniq. When he finished, the door opened and a drone came flying into the room, carrying a present for Kroes: the book Robotics for Future Presidents. Before she left, Kroes asked where RoboValley will be in two years. “I can assure you that we have filled 90 percent of all the office space that will come available with RoboQuarter!”, promised Van den Ende.